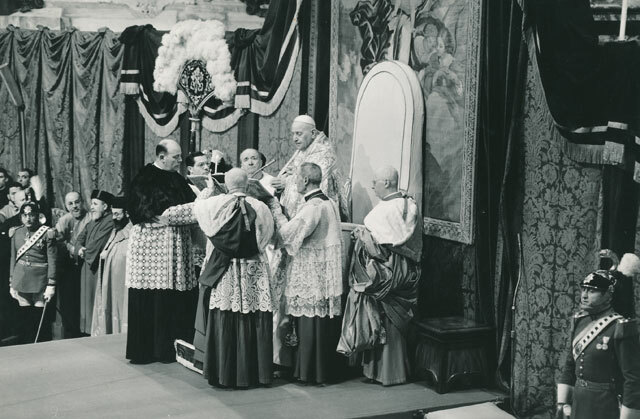 Below is the full text of the homily delivered by Pope John XXIII during the solemn ceremony of canonisation of Peter Julian Eymard, Anthony Mary Pucci and Francis Mary of Camporosso at St Peter’s Basilica on 9 December 1962. The Solemn ceremony in which the supreme honours of the Church have been given to Blessed Peter Julian Eymard, Anthony Mary Pucci, Francis Mary of Camporosso, is one which very deeply moves Our soul. This rite, while performed by Us here below, is ratified by almighty God in heaven, which resounds with joy. It brings back to mind and, so to speak, sets before our eyes that note of holiness which marks the Catholic Church, the Spouse of Christ. For Catholics it is a joy and pleasure to call our dearly beloved Mother the Church holy, as part of the very foundation of our belief. This is also strengthened by many good reasons. First of all, her Founder is holy. In very fact, He is the Source and Model of holiness. Next, we must esteem also as holy those means which she uses for the perfection of souls committed to her care – divine grace and the sublime sacraments. Her doctrine is holy, the one she received from Jesus Christ and which she keeps inviolate, defends with vigour, actively imparts to her children, and, as widely as possible, preaches to all nations. Furthermore, very many of her children who shone with marvellous virtue have now been publicly declared to be possessors of eternal glory. All these things, We say, are held as certain and clear by all Christian men. But there is no one who will deny that by the striking scene that We are witnessing today, the notion of the Church’s sanctity strikes even more deeply into their souls. We would like now to continue our discourse as a familiar conversation in Italian, in order to associate more closely to the intimate joy of Our heart the numerous faithful assembled in this basilica and all the others who are following this ceremony by radio. Starting today, the whole family of the faithful behold three new brilliant stars in the heaven of sanctity: Saint Peter Julian Eymard, Saint Anthony Mary Pucci and Saint Francis Mary of Camporosso. And if three religious families, of ancient and new tradition – the Fathers of the Blessed Sacrament, the Servants of Mary, and the Franciscan Capuchins – rejoice at the honour that befalls them, the whole Church, with them, joins in prayer to the new saints in order to receive the first fruits of their intercession and of their heavenly favours. The luminous personality of each would deserve to be brought out immediately, and this will doubtless be done by orators and writers. For Our part, it pleases Us to signal at this time a certain significant affinity in the teaching and in the example of these three men of God who belonged to the same generation. Three things stand out in their existence on earth, in spite of their different occupations in line with their special vocation: their eucharistic life, their very tender piety for Mary, and their imitation of the Good Shepherd. There flows from these three examples an intensely moving message for the faithful and for all mankind. How visible is this progressive transformation into the very life of the divine Saviour, in the admirable development of the virtues of the saints canonised today! And what dealings of particular intimacy with Jesus Eucharistic do we not discover in their ascent to sanctity! The name of Peter Julian suffices to unveil to our eyes the splendid eucharistic triumphs to which, in spite of trials and difficulties of all kinds, he wanted to consecrate his life which prolongs itself in the family founded by him. This little child of five who was found on the altar, his forehead resting on the little door, was the same person who in time would found the Congregation of the Fathers of the Blessed Sacrament and that of the Servants of the Blessed Sacrament, and who would radiate into innumerable armies of priest adorers, his love and tenderness for Christ living in the Eucharist. As for the holy pastor of Viareggio (St Anthony Pucci), had he not imbued the lay associations founded by him with the same deep eucharistic spirit which is the distinctive mark of the Christian? This thirst of eucharistic apostolate sprung from a heart full of love for Jesus Victim. Eyewitnesses have left us moving descriptions of this love for Christ in the Eucharist. An identical eucharistic piety also characterised the humble beggar Brother, Francis Mary of Camporosso, whom everyone called ‘the Holy Father’. And justly so, for his passing here below renewed the perfume of the Franciscan fioretti. The eucharistic life is the secret of the generous impulses which raised these three religious to the heights of sanctity. 2. Marian Piety: At the side of Jesus there stands His Mother, the Queen of all the Saints, the source of sanctity in the Church of God and the first flower of its grace. Intimately associated with the redemption in the eternal plans of the Most High, the Blessed Virgin, as Severiano di Gabala expressed it in song, ‘is the Mother of salvation, the source of light become visible’. Hence filial piety is pleased to consider her at the beginning of all Christian life to ensure its harmonious development and to crown its fullness by her maternal presence. Thus it is not surprising to meet the Blessed Virgin Mary in the life of the three new confessors whom she accompanies step by step. Saint Julian Eymard proposes her as a model to adorers, invoking her as ‘Our Lady of the Blessed Sacrament’, Saint Anthony Maria Pucci, faithful to the traditions of his community, forms the seat of his apostolate into a City of Our Lady of Seven Sorrows, by confiding to her every arduous undertaking of his ministry; Saint Francis Mary of Camporosso, with filial boldness, does not fear to send to her the unfortunate and suffering, telling them: ‘Go in my name to the Virgin of graces. Tell her that her servant Francis sends you’. What devotion fired the saints in this supernatural transport of confidence in the intercession of the Mother of God and our Mother! This delicate Marian piety has certainly added to the joy of this day. 3. Imitation of the Good Shepherd: Only one of the newly canonised has had direct charge of souls, reproducing on Italian soil the examples of the Holy Curé of Ars; but all three reflect with admirable fidelity the image of the Good Shepherd. This pastoral aspect gives us great consolation at the end of the first session of the Second Vatican Council that Our Lord has desired for a general renewal of all the forms of Christian life. Venerable Brethren and dear Sons, such are the lessons inspired by today’s triple canonisation. Our hearts are filled with joy and emotion and from Our lips praise and thanksgiving rise to the Lord who has given new splendour to the countenance of the Church in the year of the Ecumenical Council. New Saint Confessors, Peter Julian Eymard, Anthony Mary Pucci, Francis Mary of Camporosso, stand by the altar of the confession of St Peter while Mass is being offered. Through your intercession maintain in our hearts the extraordinary fervour of this historical hour, by obtaining for mankind abundant gifts of heavenly peace which have their law and their security in Jesus Christ – gifts of peace which are the joy of the Church, the consolation of pastors, the honour of the clergy and of God’s holy people. Amen. Amen.